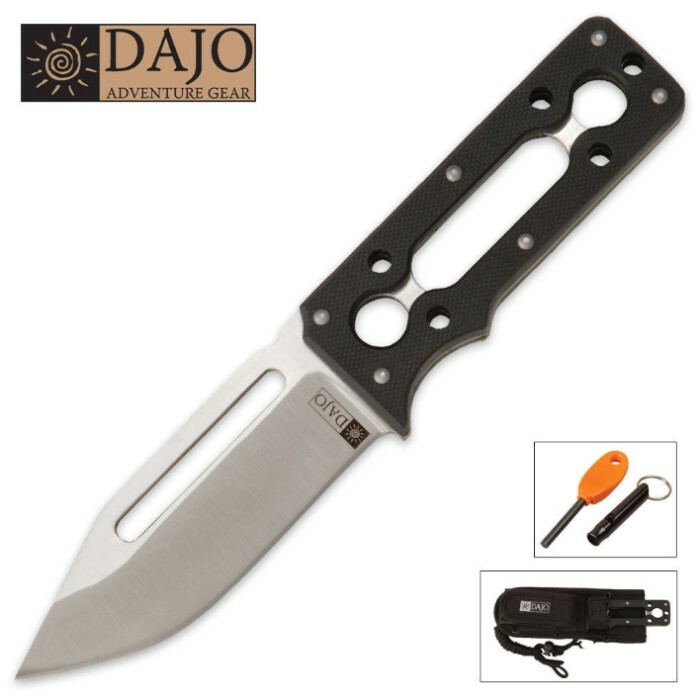 This survivor knife was designed to be a fairly minimalist, highly functional survival tool, and is suitable for a wide range of wilderness applications. The knife has a solid full tang design with G-10 handle scales, so you know it is ready to take plenty of abuse. The notch in the back of the blade is designed to act as a striker for the included Swedish FireSteel fire starter. The sheath can be mounted vertically or horizontally and holds the fire striker, an emergency whistle, and five feet of cord. It can even be fashioned into a spear with the included cord. 3 3/4 in. blade, 7 1/2 in. overall. All I need is this knife my cold steel Gurkha kukri and a water filter and I can disappear into the wilderness and survive indefinitely. Love the knife fire starter and whistle. The sheeth could use some work it already is starting to fray where the blade goes in. But the blade its self is worth more than what your paying for it.